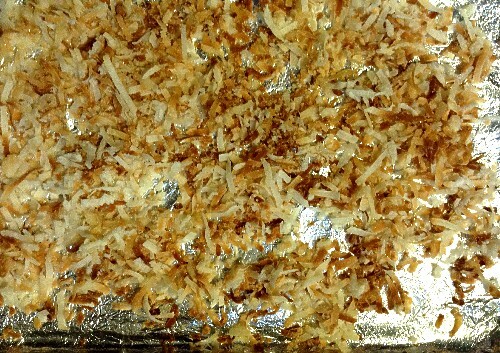 On a rimmed baking sheet, toss coconut with the kosher salt. 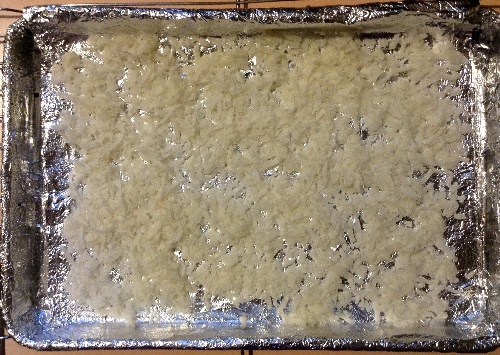 Toast coconut in preheated 350ºF oven, stirring frequently, until golden brown. Ovens vary so check. Mine was ready in four minutes (see photo at top of post); however, according to Martha Stewart (click to see recipe), toasting may take eight to ten (8 to 10) minutes. In The Dinner Doctor (page 477), Anne Byrn says golden brown takes seven (7) minutes. Let cool; then cover and store until needed.